RapidFire BBS – Excess, Laxity and Fairlight HQ – Runnning at a real C64 + SuperCPU + Ramlink + 2x Thunderdrives + 8GB! Software: Latest Holy Moses Cyborg C*Base. Real Diversi-Dial. Real Apple IIe. Real 300 baud modems. Real network chat, 1985 style. 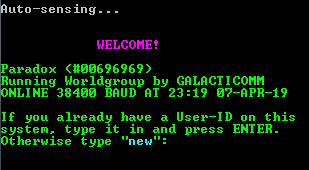 A Simple BBS to try to get back into running a BBS.